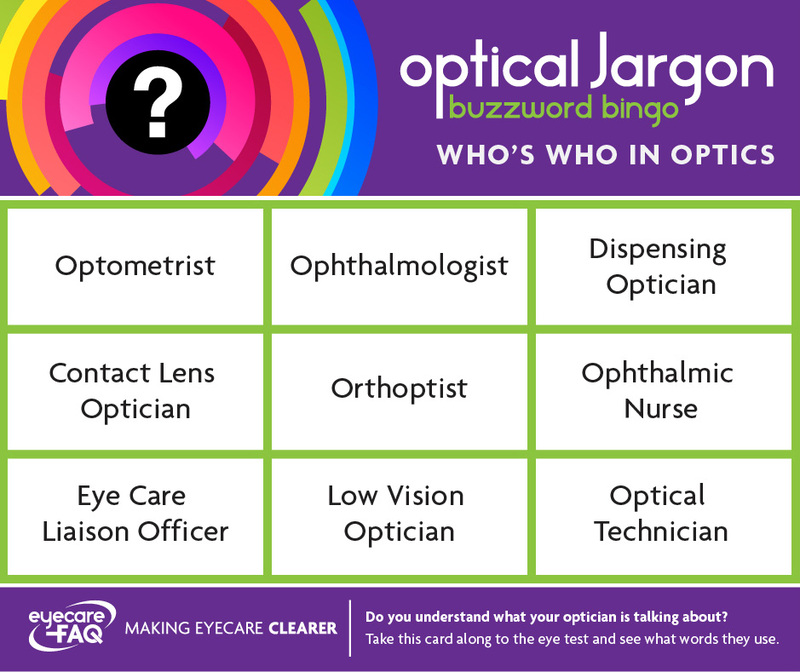 There are a number of people who work in an optical practice: the optometrist, the dispensing optician, and usually a number of optical assistants or receptionists. In some practices you will also find a laboratory where optical technicians make spectacles. To find out more about careers in the different roles click here. There are a number of people who work in an optical practice: the first person you will meet is likely to be the receptionist who can book your appointment. You may also meet an optical assistant in the front of the practice. They can assist you to choose frames and lenses and some may be trained to carry out initial assessments before your eye test. The optometrist is the person who examines your eyes. They will then pass you on to the dispensing optician who is trained and qualified to offer the best advice on frames and lenses to suit your lifestyle and prescription. In some practices you will also find a laboratory where optical technicians make spectacles. When you return to collect your new specs they may be fitted by the dispensing optician or an optical assistant. Optometry is the branch of healthcare that looks after the eyes, examining how well they function and whether there are any treatments that would help them to function more effectively. An optometrist examines eyes, tests sight and prescribes spectacles or contact lenses for those who need them. They also fit spectacles or contact lenses, give advice on visual problems and detect any ocular disease or abnormality, referring the patient to a medical practitioner if necessary. Most optometrists work in high street practice. Others work in hospitals or research departments. Some optometrists are involved in management, professional services roles in industry, training and education. With the aging population and new treatments for eye disease putting pressure on the NHS optometry is expanding into roles traditionally the domain of ophthalmologists so optometrists may also share the care of patients who have chronic eye conditions with a medical practitioner. Once qualified, optometrists can undertake further training to specialise in certain eye treatment by therapeutic drugs. Optometrists study a three or four year degree course at a university. There are ten universities that currently offer training in Optometry. After completing the degree, trainee optometrists need to go on to complete a pre-registration year where they practice under supervision of a qualified optometrist, write up case records and take further practical exams. All optometrists need to be registered with the General Optical Council. A dispensing optician (DO) advises on, fits and supplies the most appropriate spectacles after taking account of each patient’s visual, lifestyle and vocational needs. Dispensing opticians also play an important role in advising and dispensing low vision aids to those who are partially sighted as well as advising on and dispensing to children where appropriate. They are also able to fit and provide aftercare for contact lenses after undergoing further specialist training. Career opportunities also exist to develop business skills in marketing and practice management. You can study ophthalmic dispensing in a number of ways, both full and part time, on day or block release which means that this career can suit those who want to work and study at the same time. There is are various full time, day release, distance learning, FD (two year) and BSc (three year) courses available at Anglia Ruskin University, Bradford College, ABDO College in association with Canterbury Christ Church University (CCCU), City & Islington College and Glasgow Caledonian University. Many people study through blended learning via ABDO College – involving block release, distance learning assignments, in-practice supervision and examinations through ABDO. Depending which route you choose, at the end of the course you may achieve Foundation Degree and BSc (Hons) qualifications, alongside the required ABDO Level 6 Diploma in Ophthalmic Dispensing (‘FBDO’) qualification required to become a dispensing optician registered with the General Optical Council. A contact lens optician (CLO) is a specialist practitioner who is trained and qualified to fit, and provide aftercare for, patients with contact lenses. Contact lens opticians assess whether contact lenses meet the needs of the person, resolving clinical and tolerance issues, and remain responsible for clinical decisions enabling them to provide continuity of care. The contact lens specialty is open to dispensing opticians only and involves extra study and clinical practice. Once the specialist training is completed and competence assessed, practitioners must register their specialty with the General Optical Council. They are then able to perform additional duties to those of a dispensing optician. Once you have qualified as a dispensing optician you can go on to study and specialise in fitting contact lenses. A Contact Lens Certificate course is run by ABDO College. This course is delivered by a method called ‘blended learning’ that consists of practice based learning, block release and distance learning coursework. You receive coursework material to work through and assignment questions to answer for each part of the course. There are 32 units of coursework to work through, one each week. A Personal Tutor will mark it for you and return it to you with feedback. As the course is at advanced level, you will also need to undertake some additional research and read around the subject in order to gain a thorough understanding of the subject. Block release is a one week period of intensive study that will support you with your theory and practical studies and give you the chance to meet some of your fellow students. There are two of these block release periods in each year. Block release is held at ABDO College in Godmersham, Kent and it is a compulsory part of the course for all students. While you are studying for your CL Cert you will be training in contact lens practice. You and your supervisor will be issued with a workbook to guide you both through this part of your training. You will learn practical skills from your Supervisor and work with patients in practice (under supervision) to perfect these skills. To become a contact lens optician you will also need to complete a set number of case records that you build up over a one-year period and makes up a part of your final examinations. A low vision optician is a dispensing optician who has additional qualifications to support people who are blind or partially sighted, offering advice, assessment and relevant equipment to allow them to make the most of the sight that they have. ABDO College offer a Low Vision Honours course is for qualified dispensing opticians, contact lens opticians or optometrists that have a specialist interest in working with patients with low vision and who want to study further in this field. The theory course runs from January to July each year and includes a short period of intensive study (2-3 days) around Easter followed by theory examinations in the subsequent September and a practical exam after you have completed the required number of case records. Low Vision Honours prepares students for the ABDO Level 6 Diploma in The Assessment & Management of Low Vision. The Low Vision Honours course is delivered by a method called ‘blended learning’ that consists of practice based learning, block release and distance learning coursework. You complete 23 units of coursework material and assignment questions for each part of the course. You then send your work to your Personal Tutor who will mark it for you and return it to you with feedback. As the course is at honours level, you will also need to undertake some additional research and read around the subject in order to gain a thorough understanding of the subject. You can expect this coursework to take you approximately 20 hours per week. Block release is a two day period of intensive study that will support you with your theory and practical studies and give you the chance to meet some of your fellow students. There will be one of these block release periods in each year, normally at Easter. Block release is held at ABDO College in Godmersham, Kent and it is a compulsory part of the course for all students. While you are studying the Low Vision Honours course you will also be working in practice as a registered dispensing optician and developing a significant level of experience in the assessment of patients with low vision. The opportunity to work in a hospital clinic setting or a rehabilitation centre would greatly enhance your experience and contribute appropriately to your learning in this specialist field. Fifteen case records that demonstrate assessment procedures, selection and fitting of low vision aids and an aftercare regime for a minimum of three months will need to be submitted to ABDO prior to practical examinations. An optical assistant works under supervision in an optical practice to assist people with choosing frames and lenses. Some optical assistants also have training to allow them to carry out initial assessments before an eye examination such as autorefraction. If you are interested in becoming an optical assistant you need to apply for a position in an optical practice that offers on the job training. As you work you will be given the chance to study for a Worshipful Company of Spectacle Makers (WCSM) Level 2, 3 or 4 qualification via ABDO College or your employer. You can study units in Optical Support, Optical Retail Skills and Manufacturing Spectacles leading up to the WCSM Level 4 Diploma for Optical Assistants. An optical technician is trained and qualified to make or ‘glaze’ spectacles. They work in an optical lab which may be attached to an optician’s practice. They may also progress within industry to become senior management in optical manufacturing organisations. If you are interested in becoming an optical technician you need to apply for a position in an optical lab that offers on the job training. As you work you will be given the chance to study for a WCSM qualification via ABDO College or your employer with the aim of achieving the Level 4 Diploma for Optical Technicians [SMC (Tech)]. You could start with Level 2/3 Optical Support or the Level 2 and 3 Diplomas in Manufacturing Spectacles. An ophthalmologist is a trained doctor who specialises in eyes. An ophthalmic nurse has qualified as a nurse before going on to specialise in eyes. You will find them in a hospital eye clinic, providing care for people with eye diseases. An orthoptist specialises in investigating, diagnosing and treating defects of binocular vision and abnormalities of eye movement. You will find most orthoptists working in a hospital setting, helping children who have squint or lazy eye (amblyopia). An ECLO is based in an eye clinic. They are there to talk to people who may be newly diagnosed with sight loss, and to help them get emotional and practical support from local voluntary organisations, health and social care. They can help you understand more about your eye condition.